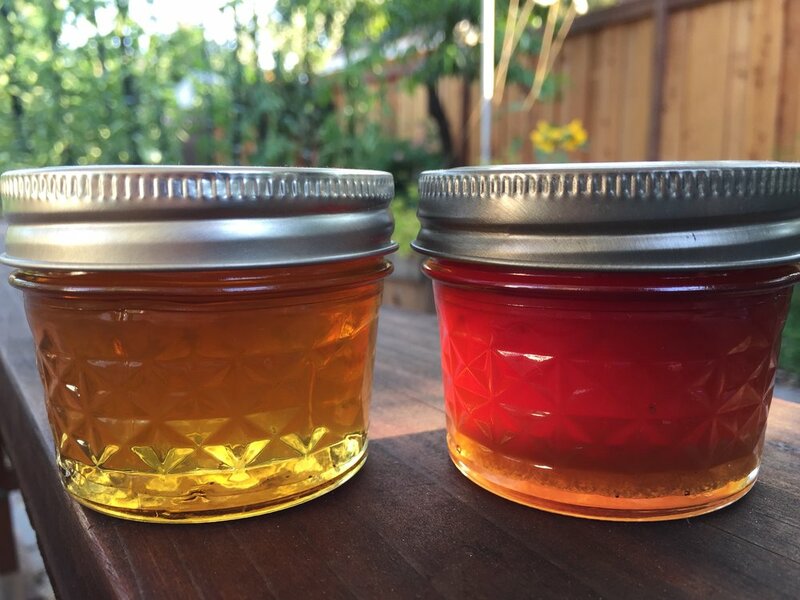 On the left, late spring honey. On the right, winter honey. Each month, my beekeeping association has a general meeting with a guest speaker. Lately, the folks at UC Davis (our local land-grant university) have been coming to give the talks. We had a great one in July about the latest research in varroa mites (given by Dr. Elina Nino, Program Director for Apiculture), and last week, Amina Harris was our speaker. She is the director for the Honey and Pollination Center. UC Davis is really leading the way in a lot of interesting agricultural studies (have you seen the latest on nitrogen-fixing corn? very exciting) and their participation in apiculture is ground-breaking. Ms. Harris' program is the only one I know of for honey tasting, which is similar to wine, coffee, or beer tasting. But the reason for it is very different. UC Davis wants to help determine if the honey coming into the US is adulterated. You may remember my post about this very issue. Imported, adulterated honey is a huge problem for our country, and the people manufacturing it keep getting around the chemical tests that have been developed to detect the fake stuff. So, Ms. Harris reasons, if we get humans on the case, with developed palates, we can begin to add another dimension to the testing of imported honey. So, she gave us a quick lesson in tasting, and it was fascinating. You can take an official course at UC Davis in this art, but it ain't cheap. So it was fun to have her explain some basics. First off, she divided all honey into four categories: Fruity, Floral, Buttery, and Brown Sugar. Within those categories there are other sub-categories with about a million flavors for each. She gave us each three samples of honey to demonstrate the first three categories: Blackberry, Orange Blossom (citrus), and Eucalyptus. Let me just state right here that in order to know what the origin of your honey is, you have to have an awful lot of property with dedicated plants. Like three square miles of predominantly eucalyptus trees, because that's the foraging range of bees. I can never state what kind of honey mine is, because my bees forage on such different stuff in my neighborhood. I can guess what they are eating in different seasons, but it's just a guess. So I could never market my honey as one certain kind. We were instructed on how to smell the honey, and what to think about and look for as we tasted it. I have to say, I'm not so good at this. I never have been. I think I have a good palate and a good sense of smell, but when it comes to describing the way things taste, I'm terrible. I'd be simply rubbish at taste-tests. All honey smells like honey and all honey tastes like honey. However I will say that when you taste test three different honeys side-by-side, you can easily tell the differences in them. But would I be able to say which flower made which honey? Doubtful. Anyway, surprisingly, I enjoyed the eucalyptus honey the most, because it had the lightest flavor (and Ms. Harris would say 'light' is not a flavor). And yet it had the darkest color, so you would assume it would have a more robust flavor. This honey tasting stuff is pretty eye-opening. Also, you can taste the pollen in the honey (if it's real and not heated) - although less pollen gets into the honey than you would think. Also, that idea that local honey helps with allergies? I've said it before, but it bears repeating: Most allergens come from wind-pollinated trees, and that means that pollen won't be in honey. So really it won't help with your allergies. However honey has a LOT of other health benefits (if it's real, and if it's untreated or heated); it's anti-viral, anti-fungal, anti-bacterial, and it never goes bad. Did you hear about that honey they recently found in an Egyptian burial site? Still good. And this is the perfect place to insert my mantra about buying honey: We should always buy local honey from a local beekeeper. It will not be cheap, in fact it will be much pricier than the stuff in the bear at your local Safeway. But this way you are sure to get the real stuff, unheated and untreated, simply filtered (to remove any wax or bee-parts) and bottled. Go to your farmers market or local health food store to purchase your honey. Today is beer-making day, pickle-relish-making day, and sriracha-making day. We ran out of sriracha a long time ago and miss it terribly. Homemade is so good! If you haven't made it, I highly suggest you do. I'm not a hot-sauce person, but I love a slug of sriracha in my Asian noodle dishes (and Adam will eat it on everything). You can find the recipe here.